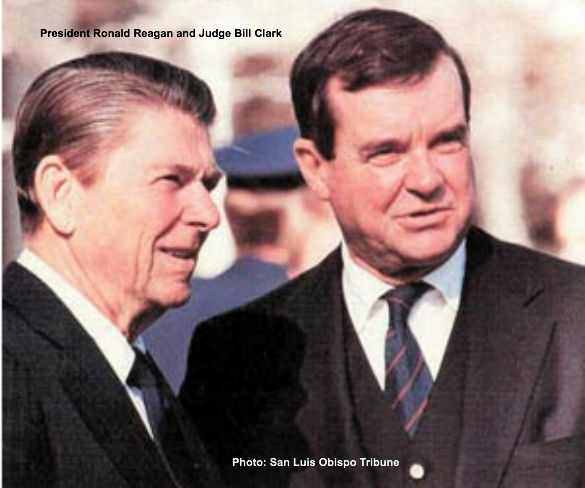 One more of the visionary Americans who were early backers and advisors of Ronald Reagan has passed away; over the weekend we were informed of the death of Judge William P. “Bill” Clark. “Bill Clark was a devout man of faith, a great patriot and a close friend. He devoted his life to the service of others and will be remembered for his outstanding contributions to his community and his Country. Bill served Ronald Reagan for over a quarter of a century as a public official, advisor and friend. He was a key figure in formulating and leading United States foreign policy during the President’s administration, and was instrumental in developing the strategy that led to winning the Cold War. During the 1970s Bill Clark distinguished himself as an excellent judge, serving on the bench of California’s Superior Court, Court of Appeal, and Supreme Court. He was widely recognized for his dedication to the Constitution and the rule of law. Bill loved the outdoors and was a successful rancher and conservationist, which he demonstrated during his exemplary service as Secretary of the Interior. He was devoted to his Church, serving in many ways as an active layman, and built a beautiful chapel on his ranch, where he led services for the Paso Robles community. His whole life was a visible example of his enduring faith. The funeral service for Judge Clark will be held this coming Wednesday, August 14th at 9:30 a.m. at Chapel Hill, the chapel that Bill and his wife Joan built on their ranch outside of Paso Robles, California. Those wishing to send their sympathies to his family may mail them to the "Clark Family, 1031 Pine Street, Paso Robles CA 93446-2537." In lieu of flowers, the family suggests a contribution to the "William P. and Joan Clark Legacy Scholarship Endowment" at Saint Rose Catholic Grammar School in Paso Robles or Mission College Preparatory Catholic High School in San Luis Obispo.